With hundreds of new and sometimes disparate tools, it’s hard to keep pace. Amazon Web Services provides a broad and fully integrated portfolio of cloud computing services to help you build, secure and deploy your big data applications. 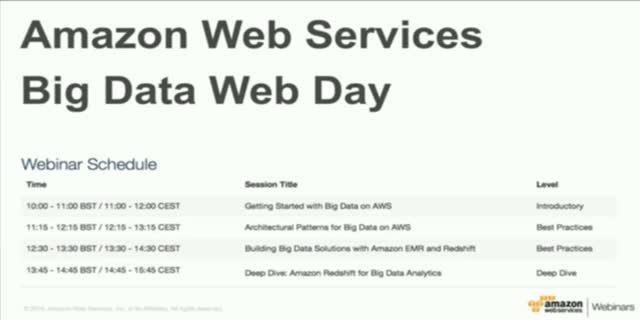 Attend this webinar to get an overview of the different big data options available in the AWS Cloud – including popular big data frameworks such as Hadoop, Spark, NoSQL databases, and more. Learn about ideal use cases, and cases to avoid, performance, interfaces and more. Finally, learn how you can build valuable applications with a real-life example.